Models are stitched on 28ct white Lugana. 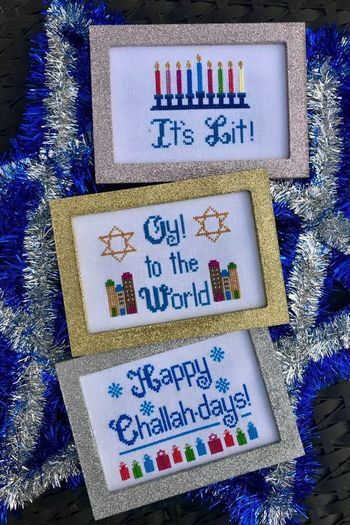 "Oy to the World" stitch count is 63 x 45; design size is 4.5" x 3.21. "It's Lit" stitch count is 49 x 41; design size is 3.5" x 2.93". Happy Challah- Days" stitch count is 69 x 47; design size is 4.93" x 3.36".